For me it's just a word I've learned to say in order to shut people up. It's one of the most easy and convenient words for me. Re: Sorry seems to be the hardest word.. I've never understood why people are satisfied with a coerced apology. If you have to ask for one, what guarantee do you have that it's sincere? An apology is meaningless unless it is voluntarily offered by the offender. That said, I have no problem with apologizing if I truly regret what I've done or if, without intent, I've hurt/insulted someone I like or respect. I don't like being told to apologize. Or that it's owed. That's ridiculous. But it seems to be good enough for the general public. Again and again someone will say something offensive, on Twitter, for example, and the whole country demands an apology. They apologize and suddenly everyone is satisfied. Unless you're Roseanne. 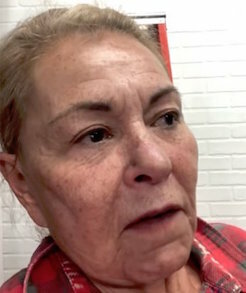 If you're Roseanne, they take away your TV show and throw acid in your face until you look like a native American. Even more cowardly and insincere are the politicians and celebrities who get their spokespeople to apologize for them. I can understand apologizing to someone just to shut them up. But in reality, that's more demeaning than whatever you've done to "warrant" the apology. If I truly believe that I've wronged somebody then I won't verbally apologise but I'll repent over time with my actions. Verbal apologies are cheap but they'll do. Oblivion wrote: I've never understood why people are satisfied with a coerced apology. If you have to ask for one, what guarantee do you have that it's sincere? An apology is meaningless unless it is voluntarily offered by the offender. Modern human behaviour is, at its heart, a sanitising of instinctive behaviour. Once we accept this, then everything becomes easier to understand. We can put it into 'dog terms' to make it easier to see. An apology is a display of submission. If it's delivered voluntarily, then it's a public display of submission to the offended one, correcting an incursion. For example: You knock someone over in the street: knocking someone over is a display of aggression, which you have 'won' because they fell and you caused it. In instinct terms, this has made you a challenger to their position, despite being unintentional. To rectify this, you say sorry, which is the human equivalent of rolling on your back and showing your balls. If you don't apologise, then you're standing by your challenge. Forcing someone to apologise is a retaliation to the challenge; like a dog mounting another dog to show its superiority. "Meaning" that you're sorry simply means that you show enough investment in the apology to demonstrate the right level of submission. Making someone say sorry is often more effective, as it corrects the challenge but the power to do this comes from the offended person, rather than the instigator. justonemoreperson wrote: To rectify this, you say sorry, which is the human equivalent of rolling on your back and showing your balls. I tried that today. It didn't turn out so well. justonemoreperson wrote: Modern human behaviour is, at its heart, a sanitising of instinctive behaviour. Once we accept this, then everything becomes easier to understand. We can put it into 'dog terms' to make it easier to see. Humans can fake submission or dominance. They are more tactical, more manipulative and can for-see consequences. They can over-ride primal instincts to apologise, or not ,depending on their long-term goals. Apologising can arise from the need to keep the peace; meet expectations. It can be a tactical move to advance forward without necessarily being submissive. It can be heartfelt. In this case it arises from care at hurting another;regret. I doubt dogs can feel this. It is that simple. What you're describing is how people manipulate the process to gain an advantage, but it's the same basic process. Everything basically comes down to power-play and, if you consider that all animals either f*ck, kill, eat or run away, every human behaviour can be linked back to those four basic functions. Some time ago, I read an article about smiling. It suggested that we like to see people smile because it reminds us of them eating. When people eat they are relaxed and non-combative, so we feel safer in their presence. Oblivion wrote: I tried that today. It didn't turn out so well. Depends where you do it. Public library? Not the best choice. I agree, humans have evolved to use the same sort of survival instincts all animals on the planet use. We live in such a comfortable environment that we don’t “need” them very much anymore but they are still there buried in our DNA and will express themselves in more subtle ways. The ability to think of the big picture and other things in the world and care about it is what separates humans but I believe if in a survival type situation we will revert back to our base instincts. For instance during times of stress or high anxiety out body instinctively increases heart rate, pumps blood to the muscles, increase adrenaline, even slows less important functioning like digestion and memory and parts of the brain that function slower than the instinctive parts.